The Herschel space telescope found the molecules in a dense patch of gas and dust adjacent to star-forming regions in the Orion nebula. Astronomers can finally breathe a sigh of relief: A team of scientists has discovered the first oxygen molecules in deep space, capping a nearly 230-year search for the elusive cosmic molecule. 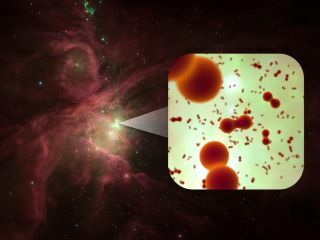 The oxygen molecules were detected in a star-forming region of the Orion nebula, roughly 1,500 light-years from Earth, by the European Space Agency's Herschel Space Observatory. The observatory used its large telescope and infrared detectors to hone in on the species, which is thought to be common in the cosmos, but has so far been hard to find. Individual atoms of oxygen (called atomic oxygen) are common in space, particularly around massive stars. But molecular oxygen, which is formed of two bonded oxygen atoms and makes up about 20 percent of the air we breathe on Earth, has eluded astronomers until now. The squiggly lines, or spectra, reveal the signatures of oxygen molecules, detected in the Orion nebula by the Hershel Space Observatory. Astronomers searched for the elusive oxygen molecules in space for decades using balloons, as well as ground- and space-based telescopes. The Swedish Odin telescope spotted the molecule in 2007, but the detection could not be confirmed. The discovery by the Herschel team has been confirmed, cementing the existence of molecular oxygen in space. Goldsmith and his colleagues suggest that oxygen is actually locked up in water ice that coats tiny dust grains. They think the oxygen detected by Herschel in the Orion nebula was formed after starlight warmed the icy grains, releasing water, which was converted into oxygen molecules.